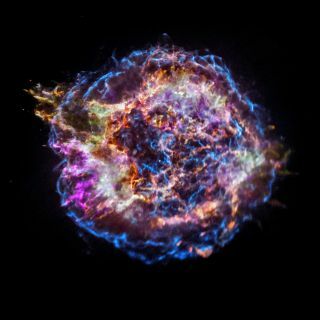 The supernova remnant Cassiopeia A shines in this stunning image from NASA's Chandra X-Ray Observatory. Thousands of astronomers,astrophysicist and space policy officials will meet this week in Washington, D.C. this week at the 231st meeting of the American Astronomical Society. Astronomers, astrophysicists and other space scientists from around the U.S. are gathering in Washington, D.C., this week for the 231st meeting of the American Astronomical Society. During the biannual meeting, which is often referred to as the "Super Bowl of astronomy," scientists will present new research on topics such as the solar system, planets around other stars, gravitational waves and more. NASA scientists and engineers will also preview the agency's new Transiting Exoplanet Survey Satellite, scheduled to launch in March 2018, as well as the new James Webb Space Telescope that will launch in 2019. Other discussions and presentations at the conference will address the biggest astronomy events of 2017, including the Great American Solar Eclipse, the discovery of gravitational waves coming from two merging neutron stars, and the damage Hurricane Maria inflicted on Puerto Rico's Arecibo Observatory. Space.com will be in Washington all week long to bring you all the latest news from what will be the largest gathering of astronomers in the U.S. this year. The conference begins today (Jan. 7) and will continue through Friday (Jan. 12). More than 3,000 scientists, educators, journalists and general space enthusiasts are expected to attend, AAS spokesman Rick Fienberg told Space.com in an email, adding that AAS meetings in D.C. tend to draw the largest crowds. "A typical winter AAS meeting elsewhere attracts around 2,500 people. There are so many astronomy-related institutions in the D.C. metro area, including funding agencies, that we always get a big boost in attendance by meeting there," Fienberg said. On-site registration is open to the public, but it isn't free. If you'd like to make last-minute plans to attend, you can find more information on the AAS 231 website. Some of the briefings will be webcast live for reporters during the conference, and the recordings will be available to the public online shortly afterward. You can watch the webcasts here once they become available. Visit Space.com this week for complete coverage of the 231st American Astronomical Society meeting.